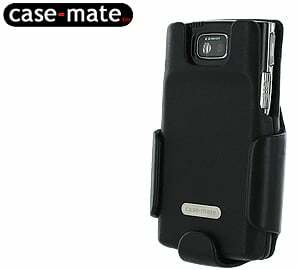 Case-Mate has been making cell phone and MP3 player accessories for about three years now. 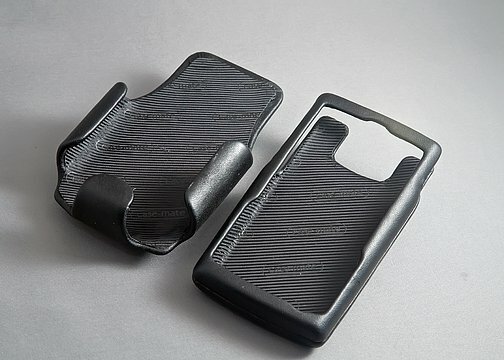 They have introduced a premium leather case for most cell phones, the Case Mate Signature Case-Holster Combo ($49.95). In testing this case with the Samsung BlackJack II the case shows a lot of promise. To see how well this signature case is, read on! The Case-Mate Signature Case-Holster Combo is a leather shell that the phone slides into accompanied by a belt clip holster. The case itself is Napa Leather that is wrapped around a plastic shell. The interior of the case is lined with a soft fabric that has the feel of silk or rayon. The plastic shell offers a level of protection for the phone. The leather is fitted tight and stitched really well. The phone slides down into the case from the top and fits snug, real snug. Placing the phone in the case is easy but because of the snug fit, it’s a little challenging to remove the phone. The volume key, camera and sync/charge ports are exposed but the micro-SD card slot is not. With the challenges of removing the phone from the case, not having the micro-SD slot exposed can be a little frustrating. The case itself adds a good amount of bulk to the Samsung BlackJack II but adds very little weight. 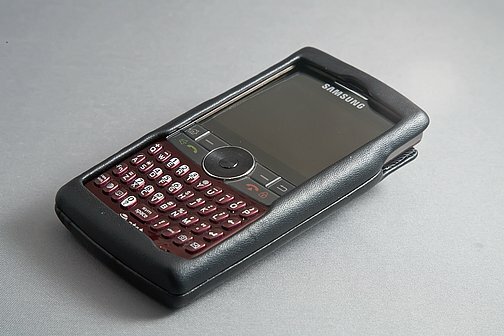 In the case the BlackJack II comes close in size to the Treo 750 or Blackberry Curve. The leather adds a degree of “grip” to the phone and does not impede any functionality of the BlackJack II. You can pocket carry the case but due to the increased size, the BlackJack II was a little uncomfortable to carry in a pocket. The holster is also made of “impact resistant plastic” (Case-mate’s wording) that is wrapped in Napa Leather. The holster is also lined with the same soft fabric the holster is lined with. 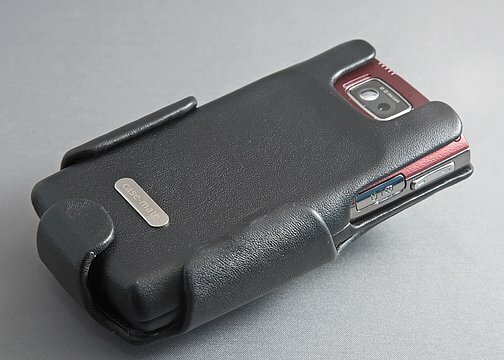 The case slides into the holster and is held in place almost as snug as the case does to the phone. You can carry the case screen out but I agree with Case Mate’s recommendation to carry the case with the screen inwards to maximize protection. My only concern with how the case fits into the holster is that due to the snugness, the holster may wear the leather on the case thin along the edges. After a couple of days of use, I could begin to notice slight wear but as mentioned, the snugness weakens slight and the wear may be minimal. The holster rode comfortably in either the horizontal or vertical position. I actually liked it best by rotating the holster slightly forward. This grip does relax a little with use but not enough to be concerned about the phone slipping out of the holster. The easiest way to remove the case from the phone is to push up from the exposed bottom of the phone to get things started. The clip on the holster is firmly installed and rides securely on your belt. It rotates 360 degrees to allow for horizontal carry. The only weakness in the belt clip is that the rotation is a little loose. If you use this holster for horizontal carry it has the tendency to drift when getting in and out of cars. I exited my car one day to find the holster had turned to the 180 degree mark with the phone facing downwards. Surprisingly the phone did not fall out of the holster, a testament to the grip of the holster. Case Mate does provide a screen protector with the combo. For the Samsung BlackJack, I can only imagine that the screen protector was included to protect the screen from being scratched as it is place in/removed from the case. However, I couldn’t see any stitching or seams on the case that would scratch the phone. The Case Mate Signature Case-Holster Combo ($49.95) is impressive. The leather skin case fits firmly onto the phone and offers a moderate level of protection. The holster is well made and holds the case firmly on your hip. The leather feel does give this case a “signature” touch for the company but the bulkiness may not appeal to everyone.